Edinboro University of Pennsylvania has been a recipient of scholarship grants totaling $572,000 from the Newcombe Foundation since 1981. The Foundation funds annual University-wide scholarships for students with disabilities that are available at Edinboro’s three campuses. The annual grants are supplemented by the earnings from Edinboro’s endowed Newcombe Foundation Scholarship Fund, to which contributions have been made by the Newcombe Foundation, other donors, and Edinboro University’s Board of Trustees. Newcombe Scholarships at Edinboro provide support in the form of partial tuition scholarships or as assistance with special expenses, internships, adapted equipment, and housing needs. The Newcombe Foundation celebrates Edinboro University of Pennsylvania’s commitment to providing access to quality higher education for students with disabilities. Edinboro University of Pennsylvania, one of the fourteen universities in the Pennsylvania State System of Higher Education, is a multi-purpose institution of higher learning, and is one of the leading educational institutions in western Pennsylvania. Located in the resort community of Edinboro, Pennsylvania, the University is only eighteen miles from Erie and within 100 miles of the educational and major population centers of Buffalo, Cleveland, and Pittsburgh. Edinboro University enrolls more than 8,000 students and offers 108 degree programs. The campus maintains the largest community of resident students with severe disabilities attending any institution of higher education in the Commonwealth of Pennsylvania. All members of the campus community benefit from a campus that is rich in diversity and that provides high levels of accessibility for persons with disabilities. Meeting the unique needs of students with significantly involved physical disabilities has been a mission within the Office for Students with Disabilities at Edinboro University since its inception in the mid 1970s. One of the unique cornerstones of this mission has been the availability of Personal (or Attendant) Care Services. 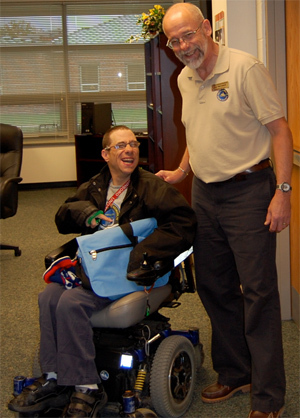 Dr. Bob McConnell, Director of the Office for Students with Disabilities, enjoys a light moment with Jim, a current Edinboro University student. Personal Care Services at Edinboro began in the late 1970s by using student workers to help with the daily living requirements of students with significant disabilities. This service was and continues to be provided in the residence halls using a shared caregiver model. As more and more students with disabilities applied for and were accepted by the University, the needs of these students grew to the point where it became economical to have attendants on duty twenty-four hours per day, seven days per week. By the end of the 1980s, as a result of continued high demand and difficulty in scheduling over 100 student workers, some non-student attendants were hired as lead workers to supplement the student workers. Demand for these services continued to be high, and in the mid- 1990s, a core group of full and part-time University-employed attendants were in place, supplemented by about two dozen student workers. This shared caregiver model continues today and Edinboro University is one of only a few institutions that has available attendant care services 24/7 and is the only one that employs attendants as regular employees of the University. Providing attendant care services allows students to focus energy and attention on being a student and participating in activities, clubs, and organizations like any other student. Since attendants only work in the residence halls, students need to learn to be independent in managing their needs when leaving the residence hall. University coordinated attendant care services are limited to the first floor of a residence hall, allowing for a total of forty-eight students to be served by this program. Some students elect to provide their own attendants and that option is also available for students residing in other residence halls. The availability of personal care services is also a significant component in the decision making process for many students who want to go to college but who struggle with a significant disability. Without these services, most students would not be able to attend the university as a residential student and, in fact, attending any higher education institution may be out of reach. Zach S., a Fine Arts/Applied Media/Graphic Design major from Ohio, is an example of a student with a significantly involved disability who came to Edinboro University because of its Attendant Care Services program. He claims, “Without personal care services it would be almost impossible for me to attend college. Thanks to those services it is quite easy to obtain the assistance that I need.” Zach uses a power wheelchair to get around and needs assistance in all aspects of daily living – in getting up in the morning, during daily activities, and finally in going to bed in the evening. Zach relies on his service dog, Nemo, to provide assistance to him throughout the day; his attendants assist in caring for Nemo as well. Although the provision of attendant care services removes some responsibility from the students, it is important for students to learn what is necessary for hiring attendants after graduation. Edinboro University employs an Occupational Therapist who offers guidance about attendant care issues, especially involving scheduling. The University realizes the importance of allowing the student to have choices and to make those choices based upon their unique needs and desires. One of the unique components available to students is a fully accessible apartment where students can practice skills learned over the course of two-week stays in the apartment. This unique living laboratory allows students to first learn about independence and then experience independence, albeit under a controlled environment.